Creative people can use unanticipated ways to develop and grow their business. An example of how billboard marketing is used differently is shown by Christopher Tasca. As cited in a post on Forbes, the billboard ads commonly work for estate agents, jewelers, or insurance brokers. However, Tasca uses them differently, namely to sell private jet charters and jet cards. How? Private jet charters are commonly associated with high-end customer segments. Most of the marketing efforts use online media. 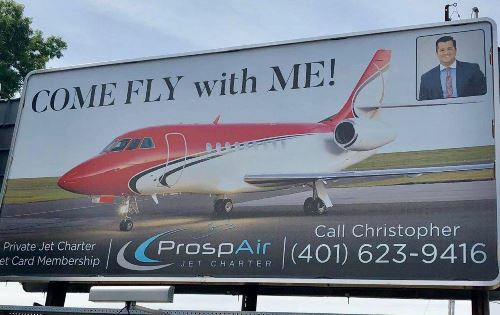 Interestingly, Prosp Air Jet Charter, in which Christopher Tasca serves as a Director of Sales, uses billboards as marketing tools. The company, which operates a number of private jets, now has three locations. It also plans to add at least three more locations of the service. When most businesses think twice about billboards for targeting broad segments of customers, Prosp Air Jet Charter shows an interesting fact. The brokerage arm of Dumont Group gets more than 80.000 impressions every week for its first location in Rhode Island. Actually, Tasca has some reasons to choose billboard marketing. Tasca says that the Rhode Island itself has about 40 regular customers of private aviation services. Half of them are his regular customers. He said that personal connection matters the most. Just like the insurance and high-end real estate industry, private jet charter is about relationship. Building trust to the existing customers is more important than trying to reach wider segments of customers. By putting his picture on the billboards, he wants the customers to know what he looks like. He wants to be there for them, instead of just being at the end of a phone. He stands behind what he is saying, instead of just being a person who answer email and messages anonymously. He wants them to be able to find him effortlessly. According to Tasca, he does not expect that all people who call him are customers. Many of them realize that the costs of private jet charters are out of their reach. Tasca does not mind with such calls. He is happy to have conversation with those people. He can even provide them with solutions for flight problems, despite not being private aviation. The director of sales at Prosp Air Jet Charter also sells jet cards. The company spends about $1.000 every months for each of the billboard. However, the cost is worthy the results. The second location of Prosp Air’s billboard is near to Quonset State Airport. He also plans to open a new one near to Teterboro Airport in New Jersey. He is also looking for new strategies to obtain qualified leads. Main customers of ProspAir are mostly high-end individuals and businesses that have at least $20 millions of sales every year. These customers have many reasons to use private jet charter. They include time efficiency and exclusive services they enjoy onboard. The billboard marketing works to target these customers. He said that the billboards successfully bring him to a number of media channels, televisions, newspapers, and radios.